Love both of those kimonos but especially the first one with all the lovely mix of colours. I want to get a few more kimonos for this summer so I shall keep my beady eyes out for ones in the sale! You wouldn't know how jealous I am that you can wear Summer clothing during winter! I love the kimonos. ha, it's summer here in Australia! Love these outfits - you look great!! Lovely colors on the bag! U look fab in both! I love the bright t-shirt and clashing bag, great combo - you look amazing! I really love love your outfits! its ver chic and casual but still stylish! Congratulations on your maternity! The kimono-style covers are really cute! I love all the colours in the top outfit (of course I do! ), and "killer heels" doesn't have to mean HIGH heels! Kimonos are such a fabulous layering piece for the summer! You are glowing and beautiful! I agree that kimonos make such great layering pieces when you don't want to add warmth. These are such cute ones! I think I need a kimono in my wardrobe--it's not something I have! I love your looks. It is nice to see some summer outfits because it will be a long time before I get to anything summer like! Gah, your kimonos are gorgeous! Especially the first one - the floral print is out of this world! You make being pregnant look so easy and glamorous! I love the kimonos, they are super adorable! Love these kimonos. I always see people wearing theirs and think "I really should wear mine more often!" Maybe I will this weekend! Thanks for the inspo! I'm going to check out the ASOS petites sale too . . . I find their sizing works for me pretty well. I love these kimonos and how they add so much style to your shorts and tees. You look gorgeous. Kimonos are soo perfect for the warmer weather. They definitely dress up a simple tank and cut offs outfit :) Both from asos are so cute! 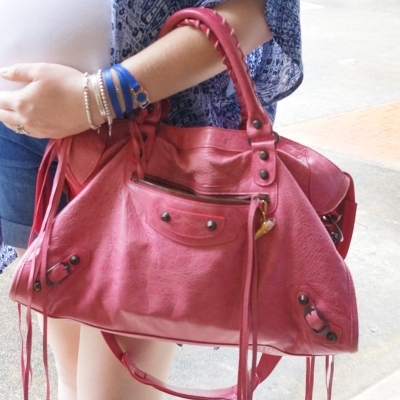 Such a cool summer pregnancy look. Such a cute look, so loving the kimonos! Ah, the kimono from your YT haul. It looks very pretty worn. I have been wearing some non-maternity long sleeves as well, but after a while I can see them wearing out around my belly from being stretched that far, so I guess they need replacement once the pregnancy is over. Hopefully there will be a great sale for you to stock up post-baby! :) I found last time I didn't stretch anything out but this time around the bump is much bigger so who knows! I love the prints of your kimonos! Both of these looks are so pretty! You are rockin' that bump! Is this your first pregnancy? 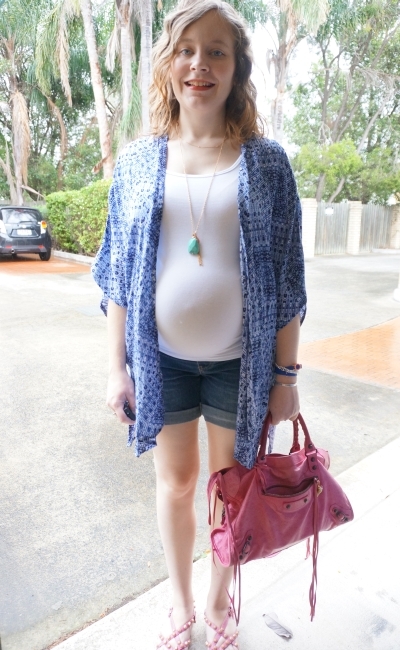 I loved wearing my kimono while I was preggers and I love the floral print on yours! East layers seems like a key thing in maternity wear to me. That way you can use the same maternity tops underneath. Your shorts and kimonos are a great combo! I'm not always comfy rocking the shorts and tank look. More of a self conscious thing, but it really is the easiest way to beat the summer heat. As you laugh to yourself thinking,"you silly Ohioan, you don't know what heat is." haha I think building a collection of simple yet interchangeable kimonos and maxi dresses is in my warm wardrobe plans! Kimonos and maxi dresses are perfect for the heat! And I won't judge your version of 'heat' because you'd laugh your head off at what I find 'cold'! haha! Such lovely pairings with tanks and shorts! I love the addition of the kimonos; they certainly add more interest to an otherwise basic look and I of course love your vibrant purses! I hope you're having a wonderful day so far, beautiful, and thanks so much for sharing! Love a good kimono. They are both so gorgeous but the print on the first is so unique that it is a standout. The brights are just so joyous to. Thanks so much for sharing!! Love that mustard yellow on you! Beautiful kimono and I love the bright yellow on you!! Love the first kimono, it's just beautiful! I am loving your kimonos! The long necklaces accent them perfectly! What a put together look for hot weather! how fun to be wearing summer looks! it is freezing where I am at now! cute looks! This is a stunning look babe!! Absolutely beautiful! It all looks perfect together, love the yellow and blue. Hope you remembered to stop by A Labour of Fashion linkup. The studs definitely count as killer! Looks like the best outfits to wear for this sort of summer heat. I love the shade of mustard. It is a lovely yellow! And such a bargain buy at the local op-shop! I love the kimono to add add the extra interest to the outfit. Thank you for joining TBT Fashion link up and hope to see you next week. Have a great weekend! Kimonos are always so pretty! Gorgeous print design Mica. Love that yellow with the first one. You are the most adorable pregnant woman ever!!! SO CUTE!!! These are both perfect summer looks and I really like your first kimono. The colors are gorgeous! Thanks for linking up with Fabulous Friday, Mica!